I think it’s safe to say that it’s officially fall weather y’all, or at least I hope so-fingers crossed! This morning was absolutely gorgeous and all I wanted to do was take a walk through the crunchy leaves in my neighborhood with my puppy, smelling that crisp air, while being bundled up in a cozy sweater. Now, most people would think that this is just a slight breeze, but for us natives-even though I’m originally from Virginia I still like to pretend-it means that the weather is turning. I’ve come to realize that we technically only have a few “good fall days” before it starts to get a little unbearable here in the south, I’m talking about that bone chilling cold wind y’all, so let’s enjoy it while it lasts! 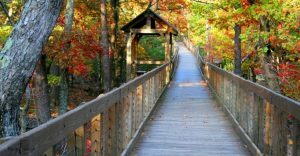 Usually around this time you’ll find less people going to the lake and more camping, we’ve got some beautiful places to hike and camp around here in the south. 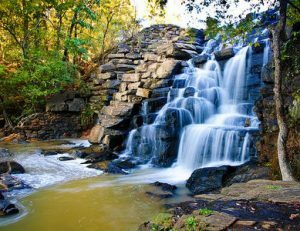 Just around the corner we have our very own Chewacla State Park and in the town practically next door we have Tuskegee National Park. Both of these are beautiful places are perfect for enjoying the changing of the seasons, the calmness of nature, and the beauty of the great outdoors. In our neighboring state, Georgia has the Chehaw Park which may seem like a hump for some locals here but trust me it’s well worth the drive, this serene location is perfect for hiking or camping, especially if you want to just get away from the hustle and bustle of cities and enjoy a nice little mini-vacation that isn’t too far away from home. Each of these beautiful locations has plenty of actives for a variety of people. From the avid mountain biker or extreme hiker all the way to the devoted reader who’d rather sit by the lake, all three of these beautiful state and national parks have accommodations for everyone. Listed below are even more activities that may interest you! See, there are plenty of things for everyone to do! So go out, enjoy this beautiful weather while we have it, and most of all take in the beauty and serenity of our parks and national forests because land is a commodity and we need to preserve it! On that note, if you’re really interested in keeping this beautiful place we call home looking fine and fresh, check out the Crawford-Willis Group non-profit ‘Mission Outdoor Recreation’ and see what you can do to help our communities stay beautiful!